Homemade version of decadent Raffaello candy… These sweet, chewy, buttery coconut almond balls are a delightful treat for every coconut fanatic! Listen up, coconut lovers! I have a treat for you. These little snow white balls are chewy, buttery, sweet and oh-soo addicting! It’s basically a homemade version of my favorite Ferrero Raffaello, coconut almond candy. If you haven’t tried it, you’re totally missing out, because they’re crispy, creamy heaven in the form of sweet little coconut balls. This homemade version isn’t crispy, but undeniably chewy from all the coconut flakes, and buttery sweet from all the condensed milk goodness. The best part: you can store these beauties in the freezer for a couple of months. So whenever craving hits, you can simply reach into your freezer. And you don’t even have to wait for it to thaw. And wait for it… To make this dessert, it doesn’t require any special skills, or precise measurement. Simply mix all the ingredients, divide into equal parts (this medium cookie scoop is perfect for this task! 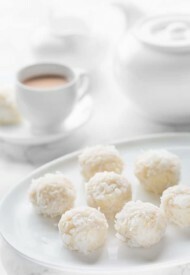 ), form into balls with an almond in the middle, and finally, roll them in coconut flakes. Placing in a cute mini cupcake wrapper is, of course, optional. Storing Tip: Heat (or even room temperature) is enemy #1 for these treats. Store them in the freezer in an airtight container and serve in small batches. Hope you make these beauties this weekend. In a mixing bowl with paddle attachment, beat condensed milk and butter on medium speed until fluffy, about 2 minutes. Mix in vanilla extract, Amaretto, 2.5 cups of coconut flakes and almond flour. 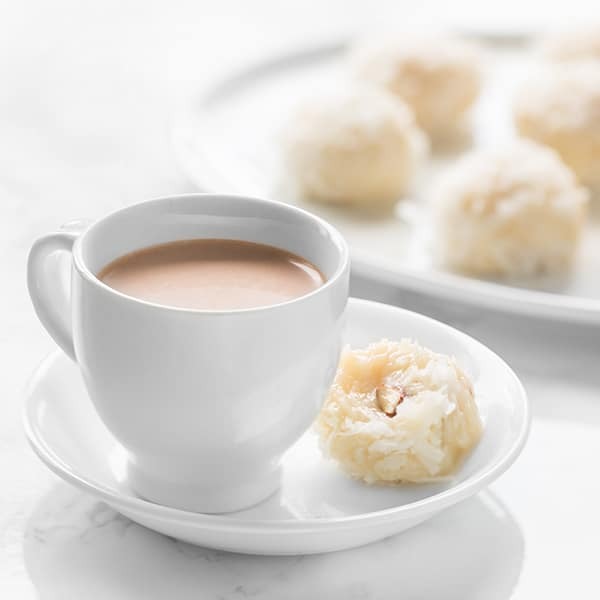 Using a medium cookie scoop, form 1.5-inch balls placing one almond in the center and roll them in the remaining 1 cup of coconut flakes. This recipe was originally published on July 30th, 2015. U don’t have to bake them ?they sound to goo to be true. Nope, no need to bake them, April. Hope you’ll give it a try. I love the simplicity of these candies. Can’t wait to try this recipe! Can’t wait to make this on my day off?? Hi, Hira! Amaretto is an Italian almond-flavored liquor. If you don’t have it, it’s ok to skip it. Hope you enjoy! Only for understanding, want to ask,almond liquor means almond essence? These look soo good. I am a huge coconut fan, love all things coconut! I will be trying these for sure! thanks. You and me are the same, Carolyn! Love coconut! Thank you for stopping by! Sure thing. Thanks for stopping by, Jenn! Yum!! 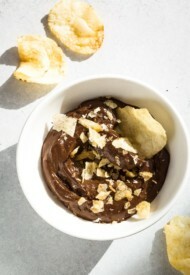 I love Ferrero Rafaello so I am going to be making some of these very soon. I’ll keep a little stash in the freezer so I can sneak one whenever I get a craving! Thanks for sharing! Yay, I still have some in freezer! And I know you’ll enjoy having them in your freezer too. 🙂 Thanks, Kaylene! These look wonderful! I would love for you to share at this weeks parties; Sunday through Thursday! Have a terrific week! They look beautiful. I will definitely be trying this at Christmas time. Yep, they are the best. Thanks for stopping by, Kelly! Stopping by from Best of the Weekend. These look perfect for holiday gifts, I’ll definitely be giving these a try. Thank you, Nicole. You’re so sweet! I love coconut treats. These look really good right now! I am a huge coconut fan too! And love the combo of coconut and amaretto! These balls sound insanely addicting! Yes, amaretto adds such a lovely flavor! Thanks, Shashi! Hi Shinee!!! I luveeee u recipes!!! Question on this one. Do I need the butter? I know it is silly but since this one it is not cooked, I feel I would be biting butter. Hi, Ana! Butter is necessary for this recipe. Without it, the balls won’t hold their shape. And since the butter proportion is much smaller compared to other ingredients, you won’t feel like biting into butter. Hope you give it a try. I’ve never had ferrero rafaello! But now I’m so eager to because these coconut almond balls look wonderful!! And I can’t believe they’re so easy to make. Mmm, I can’t wait to try this recipe, Shinee, thanks!! Ferrero Rafaello is the best! But do try this homemade version too. 🙂 Thanks, Beeta!